If you’ve been following me for a while then you know that I love to write; you also know that I began blogging to “keep my ‘chops’ sharp” even when my “real job” is not that of “author”. In the past 2 years I’ve posted over 100 times and have had nearly 10,000 hits. In the grand scheme of “bloggers” my accomplishment is minuscule. (Perhaps I should have cooked my way through Julia Child, or something, and then secured a film deal. Then again, maybe not. Maybe it’s just hip enough to be myself; and to share my examined life for a few friends). So, as a guy who really only writes for myself, I’m pretty happy that I’ve been “found” almost 10,000 times. I really do hope that I am a positive influence on you who find me. I don’t expect to find anyone who always agrees with me. I rarely even agree with myself from week to week. In fact, if you want to find inconsistencies you need look no further. I’ll point them out myself if you so desire. All I want is to live an examined life and to share it when I feel that it will make others think. In fact, all I really want is for me to THINK, and for my THINKING to help other people THINK. Although I sometimes still consider the possibility that my old friend and teacher, John Lilly, was correct in proposing that Cetaceans may have an intelligence level equal, or exceeding, that of humans; I don’t think there is any credible evidence to show that humans are anything other than the planet’s most rationality-capable beings. I may someday be proven wrong, especially given how insanely the world’s most powerful human’s behave! But, I live my own life as if my species is unique in our ability to REASON and to take action thereupon. So, just as I love to swim to keep my heart in shape and to lift free-weights to keep my musculature in shape, I read and I WRITE to keep my brain in shape. In other words, this blog, my poems, and what I post on Facebook really are, in a direct sense, FOR me. The controversy, wacky humor, and argumentation are all really mind games that I play with myself. I just like letting all of you watch it happen. Now I’d like to set aside the subject of WHY I write and to take up the subject of WHERE I do so. I have a set of free weights at home; I have a heavy bag and speed bag in the garage. Still, the most progress I make in my weight lifting is when I’m at the gym; and a single lesson in the ring with my friend, the great woman boxer Molly McConnell, is better than all my workouts on the home bags combined. The reason that this is true is a very simple thing called “focus”. When Molly is holding target mitts, I have no choice but to FOCUS. When I’m in the gym, on a weight bench, it’s far easier to CONCENTRATE than when I’m at home. This is true for almost everything. Praying is easier in Synagogue than at home. Walking is easier on a forest trail than around the block. But, I’m misusing the word “easy” when I say that. What I should really say is something like “more powerful”,,”more fulfilling”, or “more conscious”. I admit, even as an individualist, that part of this comes from doing things with other people. But………. ……… But, I believe that an even greater part of it comes from environmental appropriateness. By this I mean that a Synagogue or a church was BUILT FOR praying, a gym was BUILT FOR working out. These spaces are in a sense (yes I’m about to misuse a word for which I can think of no better) SACRED. They are places where one feels that the tasks done therein are APPROPRIATE. I don’t want to sound too much like Christopher Alexander in “A Timeless Way of Building” but, in my experience, there is value to the synergy between task and space. We do our best work when we do it where it most feels “right”. So here I am, sitting a a wonderful block-paneled room. It is a simple room: three bookcases, 4 desks, a coat rack, and some lamps. Surrounding this room is the, dare I say, “grandeur” of a large, modern, urban library. But within this room is a feeling, almost an energy, that writers of the past are sitting beside me. It’s a room that was kept largely untouched when this library was remodeled. It is not dark, or dank, or “old”, or shabby. It is APPROPRIATE. It’s the Multnomah County Central Library’s “Sterling Room for Writers”, a room that preserves the history of writing in Portland Oregon, a room where it feels RIGHT TO WRITE! I’m been working in this room for over 15 years. 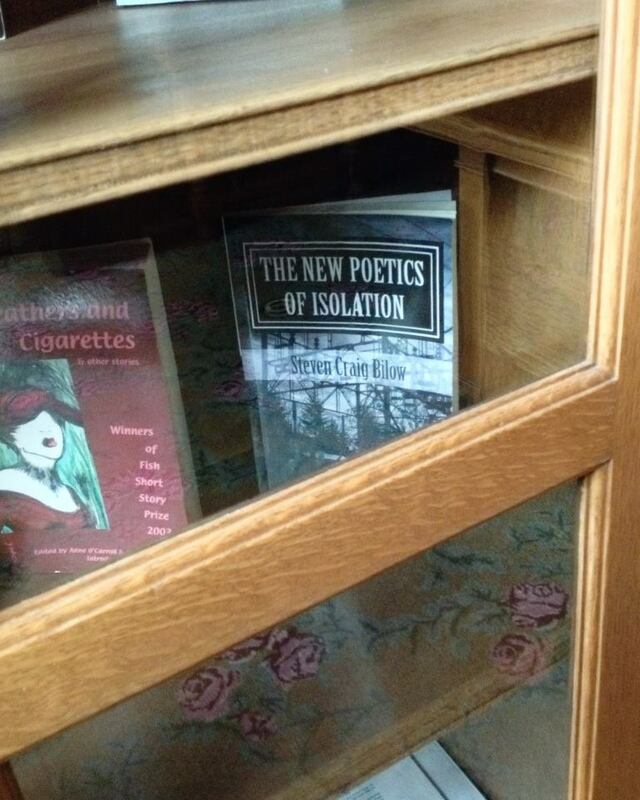 I wrote most of the poems in my new book, “The New Poetics of Isolation” (ISBN 978-14 90907659 – available on Amazon and from most other booksellers) in this room from 1998 to 2003. I can virtually guarantee that, had I not been allowed to use this room, many of those poems would not have been completed. I’m going to be borderline-narcissistic by sharing this but I want to show you all photo of the book. The conclusion I want to draw (other than the obvious and unabashed suggestion that you buy my book -hehehe) is that WHERE we choose to do thing affects the SUCCESS of our doing. Thinking, and using our rational faculties, is something that deserves the same cognizance of space and the same focus as does any physical or creative endeavor. So, I appreciate (and I hope you will take the time to appreciate) the Sanctuaries of Thinking that present themselves to you! In any case, the newest loss in my small collection of most admired people is the Polish poet Wislawa Szymborska. I’m not certain, but I believe I own all of her English translations including a few first editions and the uncorrected proof of “Poems New and Collected”. Sadly, from a collectors point of view, none are signed. Szymborska was born in 1923 and lived through the Nazi occupation / destruction of Poland. While she’s not particularly known as a “Jewish Poet” she was Jewish and only managed to avoid deportation by the random chance that she was already working as a railroad employee and was somehow missed. On the topic of Nazi’s I will admit that I don’t like every one of her poems and that her poem “Hitler’s First Photograph” does piss me off. In that poem she describes the newborn Hitler as “this little fellow in his itty-bitty robe” and “Precious little angel, mommy’s sunshine”. But her point is nothing positive about Hitler. It is that even one of the most evil men to ever live started out “cute”. My own interpretation is that we all start out sweet and innocent but that both internal psychological profiles and external influences can turn us into monsters. So, what pisses me off is not her poem but my reaction. I’ll also say that her early poems are on themes that I certainly dislike. Like many people of that time and place, Szymborska spent time as a member of the Polish United Worker’s Party and her early work reflects a socialist philosophy. At the same time, even back then, her first book did not clear the censorship process because it “did not meet socialist requirements”. But, I still can’t universally like anyone who once went on record praising the likes of Lenin and Stalin and the greatness of socialism. So, needless to say, I don’t like all of her work. The fact is, though, that when Szymborska came into maturity she shed that socialist bent and became a wonderful anti-socialist writer. She even went a bit too far, to my mind, in saying: “At the very beginning of my creative life I loved humanity. I wanted to do something good for mankind. Soon I understood that it isn’t possible to save mankind”. I’m not convinced that she really meant that because I can’t imagine this many wonderful poems from someone who has given up on trying to save us from our idiocy. More telling, I think, is her statement: “When I was young I had a moment of believing in the Communist doctrine. I wanted to save the world through Communism. Quite soon I understood that it doesn’t work, but I never pretended that it didn’t happen to me.” Ultimately she renounced Communism and all of her early poetry in praise of it. For that reason, I don’t hold her early socialist tendencies against her. She matured, came to denounce what she knew was wrong, and had the guts to accept her past and not to deny or attempt to alter it. may suddenly be taken off to Troy. they all turn into beautiful Helens. in the rustling of silk and admiration. alas, they must all be slain. from a tower of smiles. in earrings of pandemic lamentation. Triumphant. Sated with the view. Like I said, it’s a very touching poem, with some humor and enough grammatical quirks to keep you on your toes. My favorite line is: ” looking just like Mom or Dad, and sincerely horrified by it—”. I think it sums up so much of adolescent angst. Yet, as I age and as I see more and more of my father in myself, I can even relate to it as a 51-year-old man. So, it may be a poem about freckle-faced little girls but, in some respects anyway, those girls are just an allegory for all of us and how we view ourselves in relationship to our parents and our environment; and, of course, what we strive to be. In several ways, I’m proud of myself for noticing Szymborska before the Nobel committee recognized her. I love my little collection of her books. I find her transformation from ardent Socialist to one who acknowledges it’s impossibility inspiring. I love her humor and her insight. I’m saddened that I never met her. Still, I sadly must “check another one off” of my list of wonderful artists and I’m sad to see her go. Rest in peace Wislawa. You will live on; one shelf down from Sylvia Plath and just to the right of Anne Sexton! September 11, 2001 is one of those days that you never forget. It is one of those times when you always remember exactly what you were doing, where you were, and what you were thinking. My personal story is no better, no worse, and no more interesting than most others. In fact, as 9/11 stories go, mine is not that big of a deal. But I’m sharing it today because the body of stories can never be large enough to fully encompass the profound horror of that day. So, here is my memory of 9/11/2001 and a couple poems on the subject from my book “The New Poetics of Isolation”. Every year, in September, comes the largest broadcast technology trade-show in Europe – IBC, The International Broadcasting Convention. I was a Product Manager at Grass Valley Inc. and, as such, I had to be at the show for setup, several days prior to the opening. Many of us were flying to Amsterdam that week. Some on September 13th or 15th; some even earlier than I; say, September 7th or 8th. But as it happens, my friend Mark Narveson and I had chosen to leave Portland on September 10th, for arrival in Amsterdam in the early morning of September 11th. after forty-five minutes of sleep. as from an overdose of surrealism. A wedding in powder blue. the Pope and Dalai Lama now? the Moslems who defend life? tai chi group on the beach. For a cause no one understands. in the same week I read about John Adams. A café on the boul miche. A military industrial complex grows. by name, not simply number. A seven year old at Esalon? to see “General Sherman Tree”. whose liberty now stands shaken. As my gift of liberty wanes, I fear. are overshadowed by the evil. the entire infrastructure of humanity! I decided to share both of these poems, exactly as written ten years ago, for two reasons. First; while I’d like everyone to believe that I’m a compassionate, benevolent, open-minded, caring, rational guy; I’m content with sharing the fact that I struggled with that then – and that I struggle with it now. Second, in memory of those who lost their lives, I think it’s important for the families and the world to know that even we who had no family die on 9/11 are forever affected by it. Mark and I went to dinner on the night of 9/11/2001. Every restaurant and bar in Amsterdam was showing coverage of the attacks. When the trade-show finally opened, there was a moment of silence in honor of those who perished. Many of our colleagues did not even make it to Amsterdam and we who did had to spend our time wondering how we would be getting home. Most of the folks in Europe were wonderfully compassionate to us. Within a day or two, it because clear that the attacks were masterminded by the terrible beast, Osama bin Laden. This led to one of the most interesting encounters that my colleagues and I had in Amsterdam, that year. While almost everyone we met was compassionate, not all were. One night we were walking around the city, near the main train station. There was a young Arab man who saw that we were American and began yelling at us. He was drunk and was with 2 other friends. Already, he was yelling about the great man bin Laden and how we American’s deserved this. I’ll never forget that the first guy who he started to harass was the one guy in our group when was NOT American. He was German and he looked the Arab guy right in the eyes and, in a very heavy German accent he said “Piss off!” The Arab guy was completely taken aback; but it did not take long for him to start harassing us again. At this point, we were standing directly outside the train station and we had had enough. Ross Summers and I were, perhaps, 30 seconds away from getting in a fight with the guy when his friends called him off and convinced him that harassing us was probably not his finest intellectual moment. I think it would have been a very bad idea to fight with him but I always wonder just how good that would have felt. It’s probably best I don’t know. Needless to say, like every American, my 9/11 experience will be forever etched in memory. But, unlike today and unlike most times in the past, the upside of the horror was that, for a brief moment, the world felt compassionate toward America. To me that proves that, no matter what, perhaps global compassion IS possible.